Brian Gross Fine Art is pleased to announce the San Francisco debut of New York artist Adam Fowler opening Thursday, May 3 with a reception for the artist on Saturday, May 5 from 4-6pm. Hide/Reveal features Fowler’s precise cut paper constructions that are comprised of layered, gestural drawings. The exhibition will be on view through June 30, 2012. 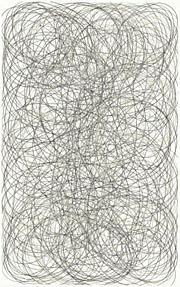 Adam Fowler’s drawings are formed through a meticulous and meditative process. 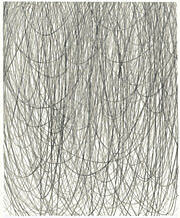 Putting thought to paper, Fowler begins with the drawing of gestural lines in graphite on multiple sheets of paper. In a painstaking process, Fowler cuts away the negative space around and between each linear network and then layers the sheets of paper to create highly complex multi-layered compositions. Hide/Reveal marks Fowler’s fifth solo exhibition nationwide and his first solo exhibition in San Francisco. The works included in Hide/Reveal feature Fowler’s signature drawings that push the boundary of drawing by physically overlapping layers of meticulously cut graphite drawings. 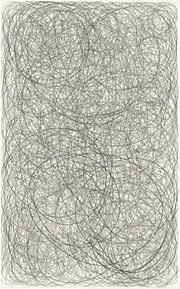 Playing with the saturation of the graphite marks on paper, Fowler accentuates the complicity in texture and form in his lighter works such as Untitled (two layers), 2011, and the competition of surface and structure in his darker works such as Untitled (three layers), 2012. Oriented vertically or horizontally, the size of the works is 18.5 by 23 inches to 22 by 35.5 inches. Infused with rhythm and complexity of composition, Adam Fowler’s drawings play with tone, texture, line, and depth. Adam Fowler was born in Fairfax, VA and received his BFA from the Maryland Institute College of Art, Baltimore, in 2001. Fowler was featured in Slash, Paper Under the Knife, an exhibition celebrating the one-year anniversary of the Museum of Arts and Design, New York, NY, in 2009, and in LineAge at The Drawing Center, New York, NY in 2005. Fowler has been the recipient of numerous awards and grants including the New York Foundation for the Arts, Fellowship in Drawing in 2011; The Pollock-Krasner Foundation Grant, New York, NY in 2011; and the Young Artist Program Grant, DC Commission on the Arts and Humanities, Washington, DC in 2004. His work is found in numerous private and corporate collections throughout the U.S. Fowler currently lives and works in Brooklyn, NY.